A spectacular collection of macro, supermacro, and micro-themed fine art images for large-size printing. Please contact us to enable sales in this gallery. 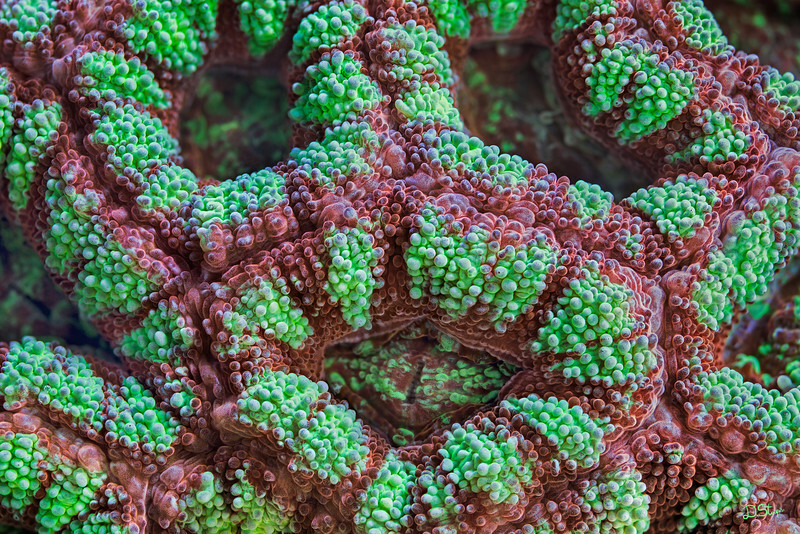 Zoanthids are about the most beautiful soft corals out there. They are found in great diversity of colours and very tough to identify. The imaged area was around 2 cm in width. Close-up of this image illustrating the amount of details captured. 30x45 inch and above recommended for the size. 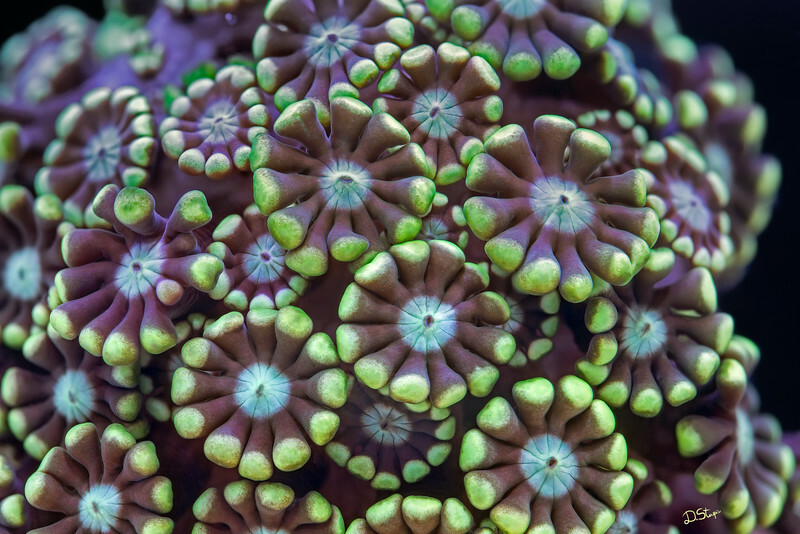 Alveopora tizadri polyps look like delicate flowers. 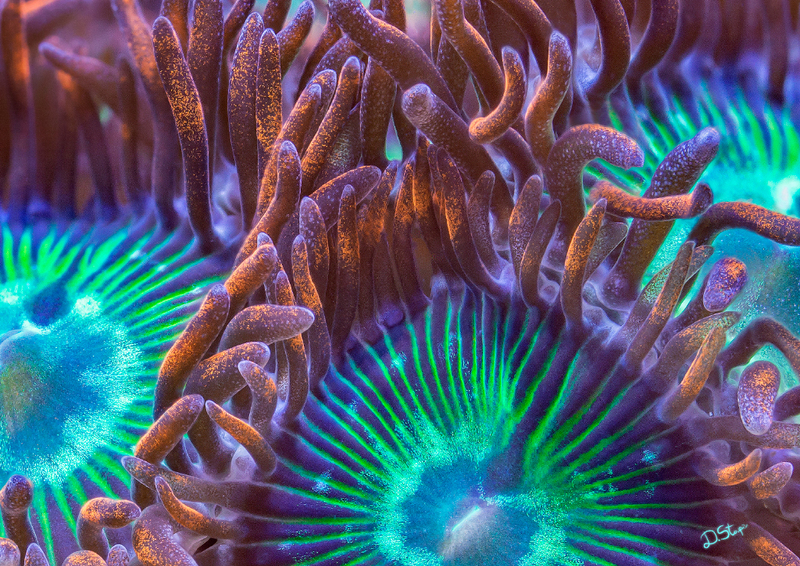 Most other corals provoke complex association due to the fact that they don't resemble anything from our familiar surroundings. Alveoporas to some extent are an exception. When the polyps retract, the skeleton of the colony (yes, alveoporas are hard corals) looks like a honeycomb. A lobophyllia coral (possibly Lobophyllia hemprichii) of a very peculiar morphology. Bright, colorful, and slowly moving creature that I could not ignore. A leather coral (Sarcophyton sp.) 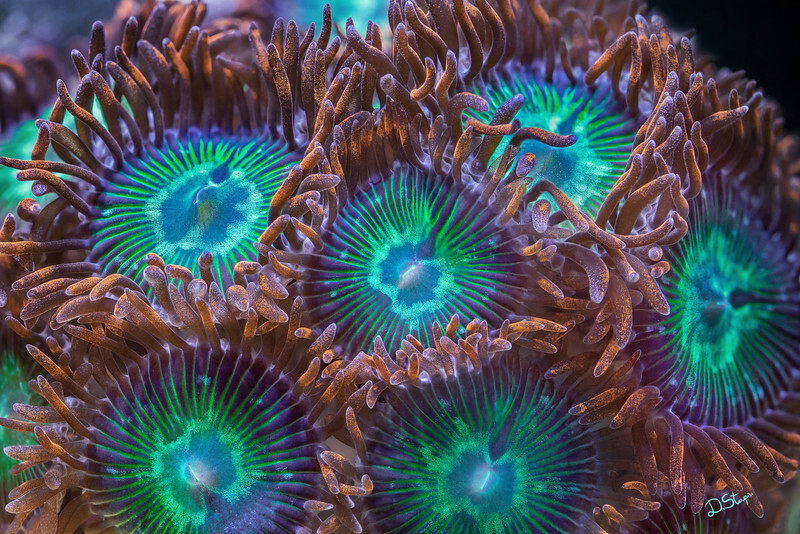 showing its brightly fluorescent polyps. 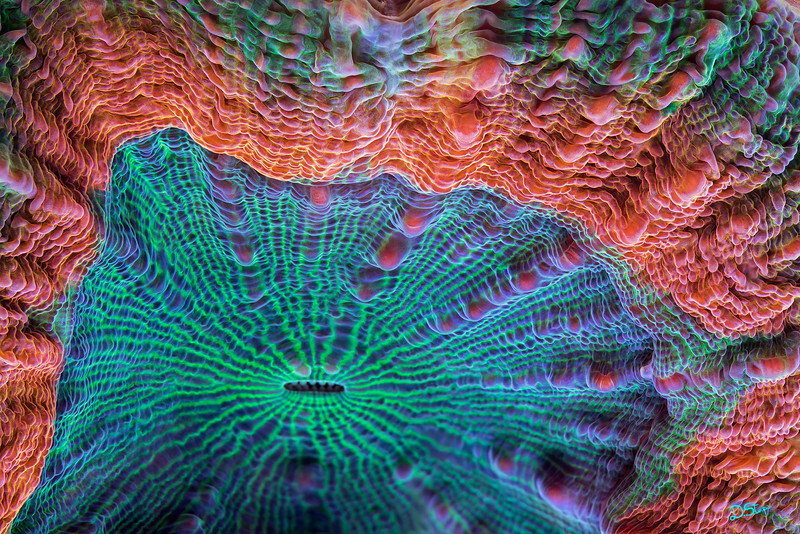 This is an octocoral, unlike the vast majority of other corals in my galleries. 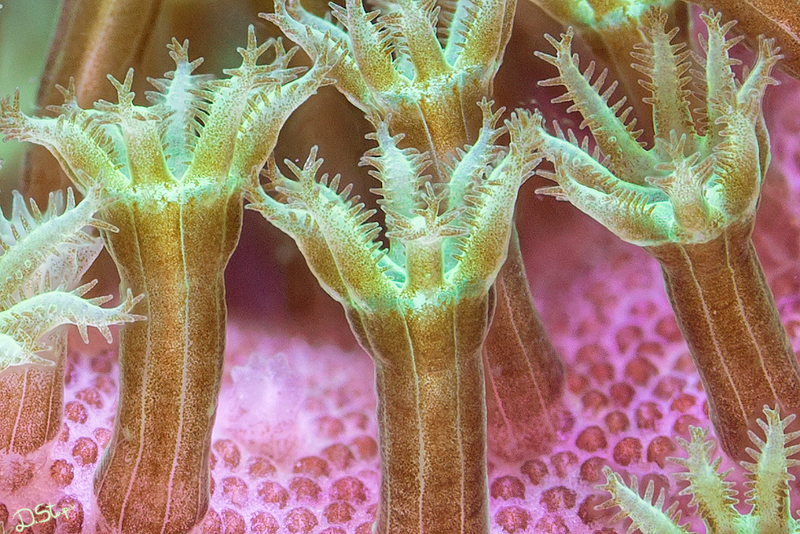 Each polyp has 8 tentacles - an anatomical feature that separates this group. 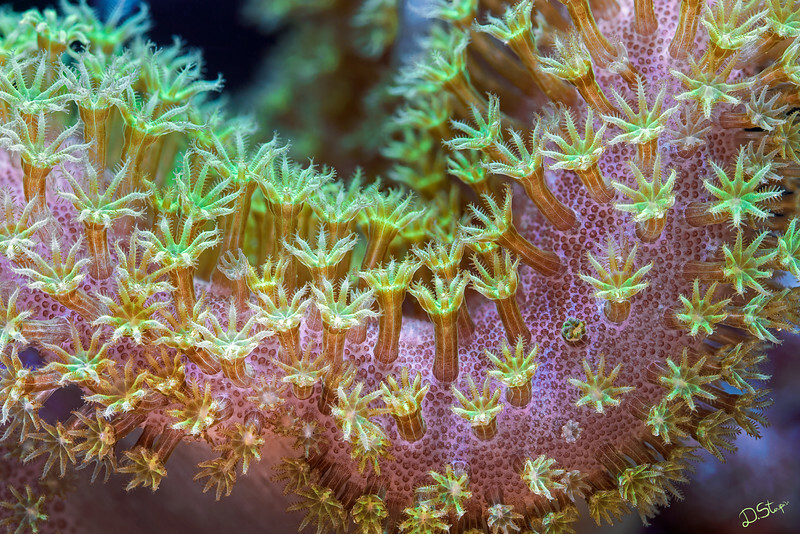 A closer look can reveal individual zooxanthellae algae inside the polyps. Larger print sizes (24x36 inch or more) tremendously increase the impact of the image. 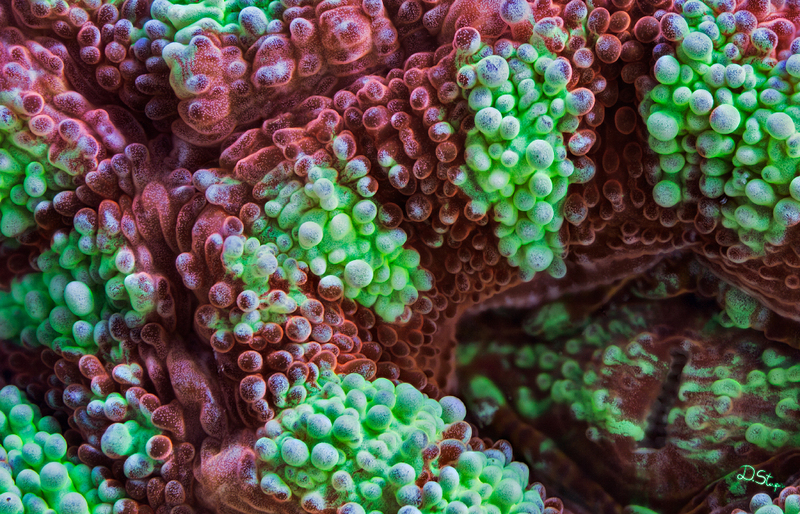 Acanthastrea lordhowensis is certainly my favorite coral for super macro fine art. They are diverse in patterns and coloration, as well as never stop fascinating with tiny details. Close-up of this image illustrating the amount of detail captured. 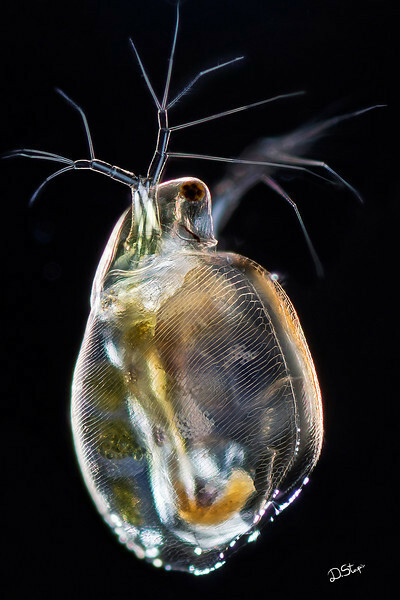 A water flea through the microscope. The image took me weeks of work to finish as it is a composite of hundreds of shots at different focus distance. Because the crustacean is transparent, automatic focus stacking was out of question - different elements could get in focus on the same area. I had to assemble photos in multiple layers and then selectively adjust which layers would be visible to deliver a realistic and fair representation of the whole animal. Metallic paper or metal printing are meant for this image and will render the shell of this magnificent creature very realistically. 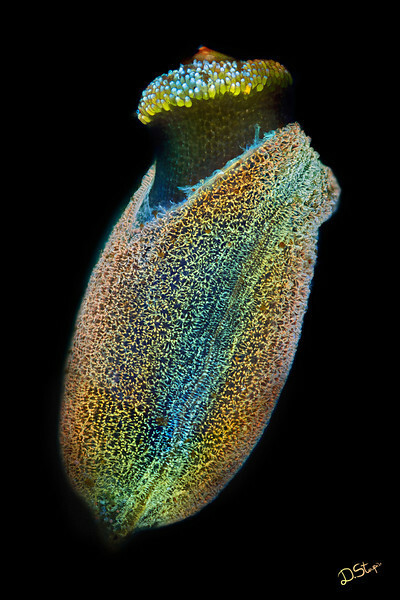 A fluorescent plant seed. I stained this seedling with a number of fluorescent dyes and exposed to UV light in order to capture those magnificent colors. The image got honorable mention in Olympus Bioscapes 2011 photo contest. The recommended size for this image is 16x24 inch.